Now that we know why the Pajero Evolution is so special, I asked Phil to tell me a little about his other JDM imports. Not so much a list of all the trucks he’s owned, but more those which perhaps lead to the Evo purchase. How did he get here from there? [AL ] Your previous Pajeros were far more pedestrian, if not more capable off road (with regards to technical terrain). Methinks you used to be more into camping and crawling, neither of which seem to have been in the minds of the engineers behind the Evo. Why go this route? [PH] My needs have evolved for sure from those early gen 1s. (No, I couldn’t resist the pun.) Once I found out I could import a JDM diesel, I sold my rough and ready gen 1 and my commuter car (a 2003 Lancer OZ Edition). I used gen 2 diesels for my long commute over country roads and towing our small travel trailers. I appreciated camping on Saturday, wheeling on Sunday, and driving to work in the same rig on Monday morning. Wheeling in Moab was definitely a highlight, and showcased what these rigs could do in stock form, simply by upgrading tires. 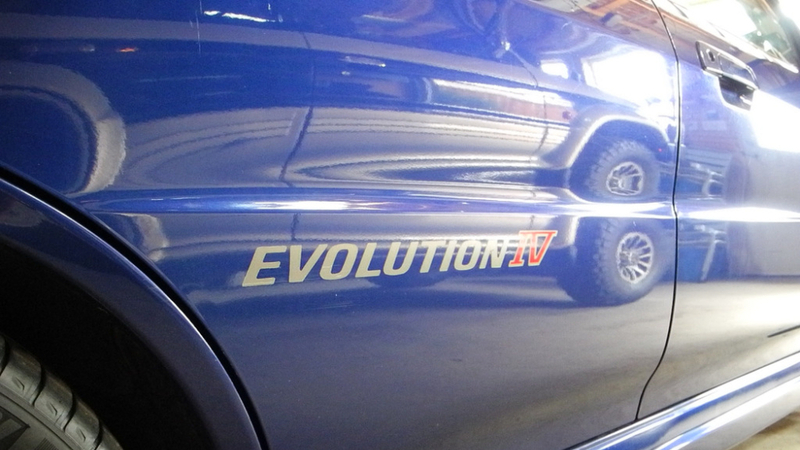 I also imported a JDM Lancer Evoluion IV. I was ready for something new; a different kind of Mitsubishi 4WD. Or so I thought? 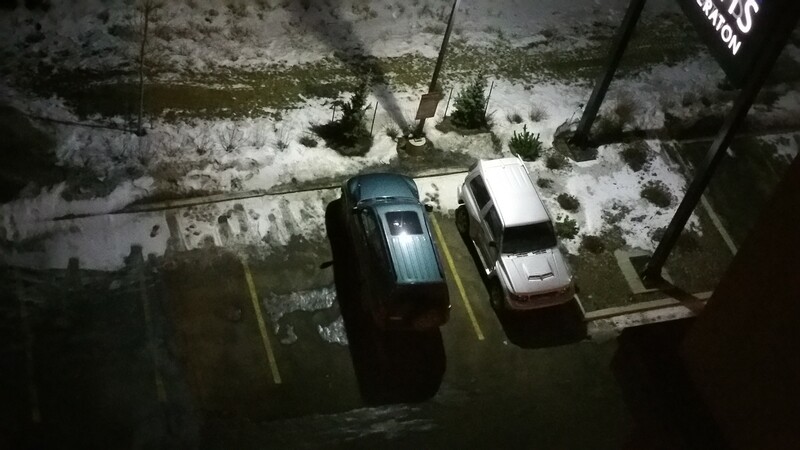 [AL ] Briefly, why have you imported JDM Mitsubishis? Why not buy something local? [PH] I imported my other three JDMs because the North American market didn’t offer something to fit my needs. This time around, I threw practicality out the window and bought what I WANTED. So far, I can’t foresee a time when this rig won’t be completely bonkers—and an absolute blast to drive! [AL ] I know you still intend to go camping with this thing, but what’s that look like? Towing a trailer? Do you feel limited by the platform? If so what are you doing about it? [PH] We bought a newer, folding A-frame style trailer, but the steep climbs here in the Rockies combined with the altitude was not friendly to a small diesel. I realized I was doing less wheeling than I used to (largely due to trail closures), so we decided to sell the JDMs and get a gen3 with the larger V6. My wife would drive it during the week and it would be our weekend adventure rig. I went back to a modern, fuel-efficient Lancer (2013 Sportback) for the commute. 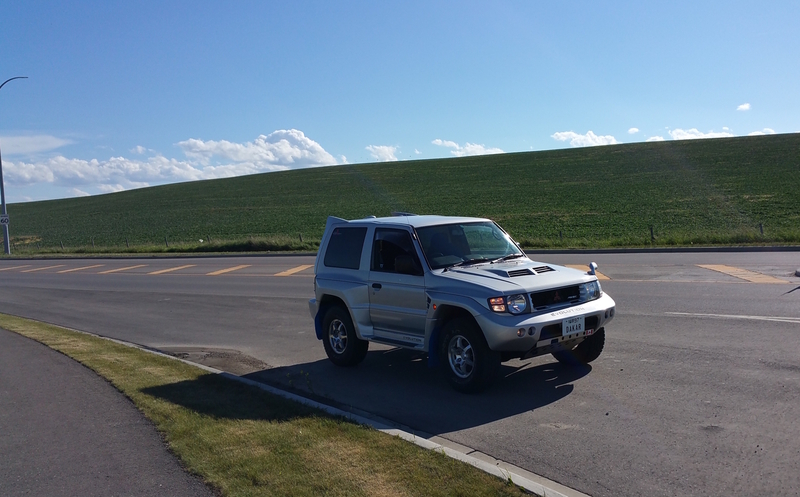 The gen 3 became “her truck” very quickly, and I was left with the feeling my favorite vehicles—the JDM Pajeros and Lancer Evo—were never going to leave my consciousness. In the gen 3, we found ourselves with a very capable and comfortable hauler-/expedition-style rig, and a super fuel efficient commuter. Now would not be the time to throw practicality out the window, would it? 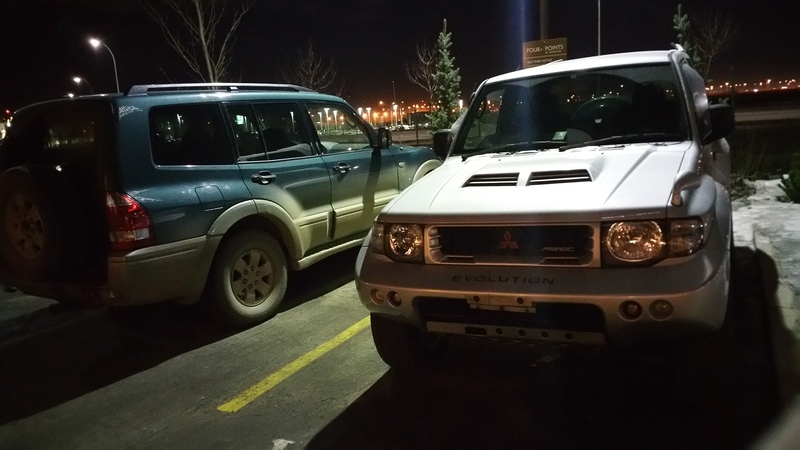 There really was no selling my wife on the practicality of a Pajero Evolution. I couldn’t even begin to build a case. Instead, I bundled it as our winter plaything, our “date” truck, our Sunday driver, and my “dream project” all rolled into one package. Not only did she go along with it, she threw herself into my auction search with aplomb until we found our perfect specimen. [PH] Going forward, I still plan to take it to Moab, mostly for some of the faster, sandy trails. It can carry two mountain bikes on the special spare tire mount. It can carry our two dog kennels, and maybe a light lunch too, if we flip the seats. I may indeed use it as a base of ops for camping on occasion, if I pack light. It will also see car shows and meetups too, in celebration of its celebrity status as number 581 of 2500, and possibly one of six in North America. Towing is not a priority for the Evo, as I have our gen 3 set up with airbags, backup camera, and a large multi-point hitch, not to mention room for kayaks and bikes as well as dogs and supplies. 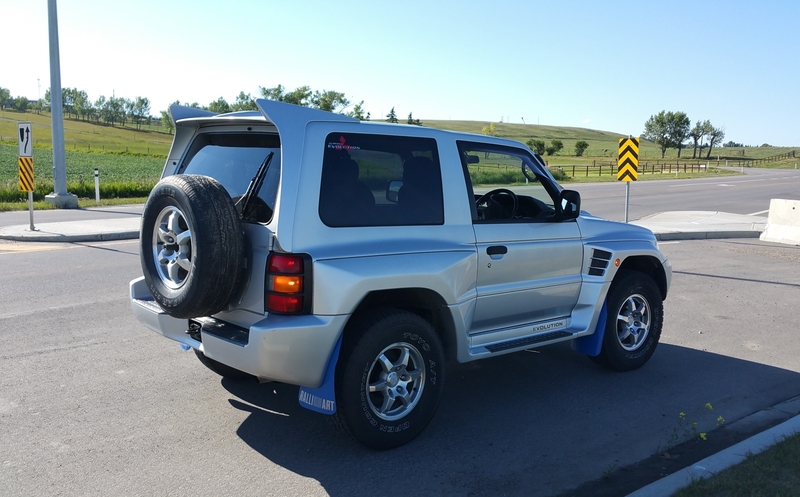 One other thing I should mention, this Evolution came to me all the way from Hiroshima with some very expensive JDM 18 inch Bradley aluminum alloys shod in Yoko H/T’s. They’ were very nice, but I felt they didn’t fit the character of the rig, so I swapped to some early gen 3 anniversary edition factory 16s, with slightly upsized Toyo Open Country A/Ts in 265 75R16 (factory tire was a 265 70R16). These are very reminiscent of the original wheels, so it looks more “correct” to my eyes (if no one else’s). If I ever track down factory Evo wheels, you can bet they’ll be getting installed. [AL ] Are you concerned about preserving your investment? How do you select modifications or improvements? [PH] I am surprised how serious I’ve become about preserving this thing. Originally, I had planned on sliders, snorkel—all the bits to make this thing more capable. But after getting it and seeing how well it had been engineered in the first place, how well it has held up over almost 20 years, and getting a feel for its exclusivity, I’ve decided that it will be staying as stock as possible. I currently have a possible lead on factory original OZ wheels, even though I’m sure I’m the only one around that knows what OE looks like on these things. Beyond the double DIN stereo, I intend to keep this thing looking as stock as possible, albeit with some subtle modern touches—LED interior lamps and possibly some hidden goodies such as a compressor and a CB.